Why are personal loan rates so high? I wanted to see what average personal loan interest rates had done over the last 10 years in comparison to other interest rates on loans and sources of lender funding. This is what I found after jumping on the RBA website. 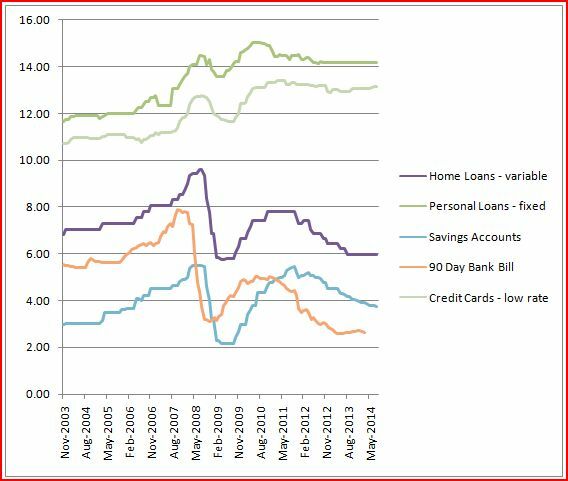 The impact on home loans, 90 day bank bills (government loans) and high interest savings accounts (personal loans to the banks) during the Global Financial Crisis (GFC) was marked. Basically the bottom lines in the graph reflect that these indicators were rising sharply and then reversed rapidly down. The rude shock is that there was little effect on personal loans and low rate credit cards. Prior to the GFC all of these indicators were basically in step with each other. What this means is that you should look to use redraw and offset facilities before taking out more expensive short term loans. If you can. If you can’t then compare lenders to get a better deal. Personal loans – secured versus unsecured – which is better?